There’s enough for people to worry about at Thanksgiving. “Oh no, not Aunt Edna’s greasy gravy.” “My brother’s bragging is going to drive me to drink.” “I can’t believe I ate the whole thing.” But we can’t just think of ourselves over this food-focused holiday: We have to look after our best friends, too. Dogs enjoy the revelry at least as much as humans, with bits of this and that dropping on the floor, and delectable smells wafting around the house. But Thanksgiving mustn’t be a free-for-all. Just because we try to pack away all we can doesn’t mean our dogs should. And there are certain items your dog really needs to avoid. “Veterinarians experience an increased number of office calls due to digestive problems after the holidays because humans invite their animals to celebrate with high fat meals (ham, gravy, turkey skin), chocolates, bones , etc.,” warns Casandria Smith, L.A. Animal Services Chief Veterinarian, in a PetFinder article. 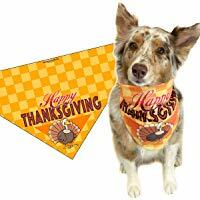 Here are some tips that will help your dog get through Thanksgiving safely and with a smile on her snout. 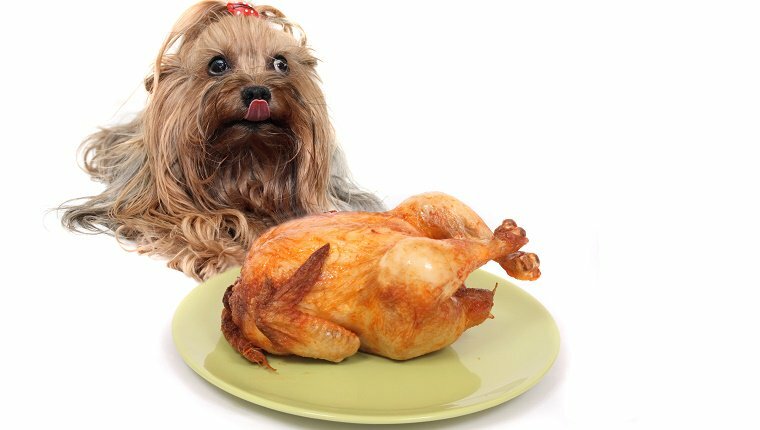 It’s easy to want to give your dog a big fat bowl of turkey, mashed potatoes, and whatever else you think she might enjoy. But that’s a bad idea. Overindulging in fatty foods can lead to an upset stomach, diarrhea, or a life-threatening condition called pancreatitis. A few strips of turkey on a dog’s normal food is fine, but don’t overdo it, no matter how she may plead with her “I’m STARVING” eyes. Keep in mind that turkey skin can wreak havoc with a dog’s digestive system, so make sure she gets skinless, boneless turkey. Here’s a great way to keep your dog busy and happy during your meal. Put a bit of your dog’s regular food in a Kong, and then stuff a little boneless turkey, sweet potatoes, gravy – just a tad, mind you – in the Kong. It’s not much food, but it will keep him occupied for a long time. A dog who has been on a big walk or fetched the ball a zillion times will be much more likely to run out of energy during the feast than a dog who’s been inside all day. A tired dog is a good dog on Thanksgiving. Make sure your pup gets plenty of exercise before the festivities begin. Cooked turkey bones can be a danger to your dog. They’re sharp, and potentially very dangerous. You may not know a dog has a turkey bone lodged in your dog’s digestive system for days. Don’t leave plates with bones lying around. Ditto for the turkey carcass. Hungry dogs have been known to run off with the remains of a carved turkey. It can happen in the blink of an eye. You notice the turkey is gone. You notice the dog is gone. With luck, you find their hiding place before anything happens. Put plates in an unreachable area if you can’t dispose of everything properly right away. Sage and some other herbs have essential oils that can cause tummy upset and central nervous system depression if a dog eats them in large quantities. Most dogs aren’t going to nosh on a fistful of sage, but keep herbs out of reach just in case. See: Poisonous Plants and Foods for Dogs. Onions are toxic to dogs. They can lead to a dangerous form of anemia that may not be detected for days. Make sure your dog stays away from the pearly whites, and yellows, and reds. See: Poisonous Plants and Foods for Dogs. Unless your dog is already on a raw diet, we wouldn’t recommend plopping a piece of raw turkey in her bowl (the change from her regular food might cause an upset stomach). But more importantly, keep your pup away from the uncooked dough for bread or rolls. What helps make dough rise? Heat. If a dog eats raw dough, what’s it like for the dough in the dog’s stomach? Warm. The dough rises in the dog’s stomach, and if the dog has eaten enough, the swollen dough can cause pain, vomiting, and bloating — conditions that can send you to the doggy ER on Thanksgiving. Some dogs seem to enjoy alcoholic drinks. Walk away from your drink that’s set on the coffee table, and Lulu may get lit. Dogs and booze are a bad mix. Your dog may not do anything embarrassing she’ll regret in the morning, but she could become disoriented and quite ill. Too much alcohol can even lead to a coma, and death. Watch where you – and others – put their drinks, especially if you have a curious pup.